product with the department of Agriculture. New legislation requires any pet foods to be registered with the Department. It is unclear at this time how long approval will take. We’ll send out a mail once we are allowed to shelf the products again. So please ensure that you are signed up to our newsletters. 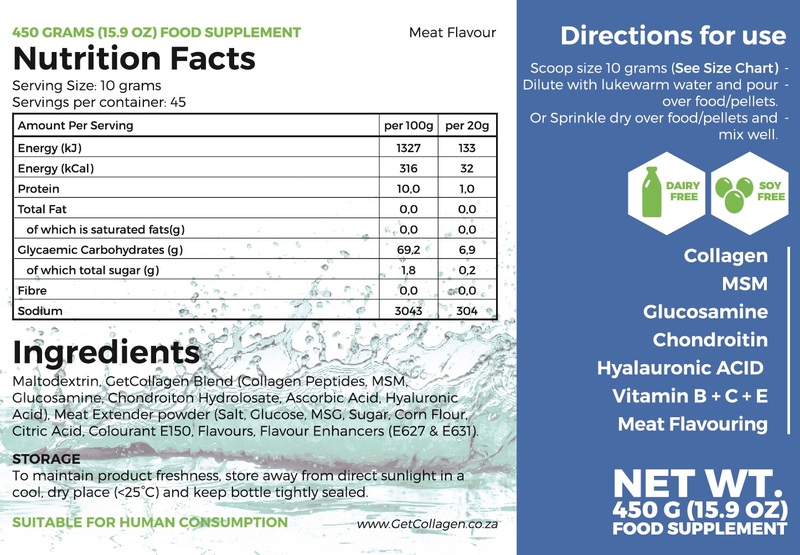 – Dilute with lukewarm water and pour over food / pellets. – Or Sprinkle dry over food / pellets and mix well. No Reason To See Your Best Friend Suffer From Arthritis/Bone Fractures or Pain. Why should you? It feels even worse knowing there is nothing you can do about it. Well, that last reference was not entirely accurate. There is actually something very helpful you may do. Ideal for pets with chronic mobility or arthritis problems, who limp and find it difficult to even walk around – For Elderly & Younger Cats and Dogs. The senior dogs will feel relief from most pain and will be able to stand, walk around, get up on your couch, while the younger ones will maintain their Skin, Joint and General health for longer. Allows your arthritis suffering dog, to regain mobility and movement flexibility to his bones. In order to be able to at least walk without the previously felt pain. It is also going to be less stressing for you, as every single pet owner tends to have a very special bond with his/her pet. 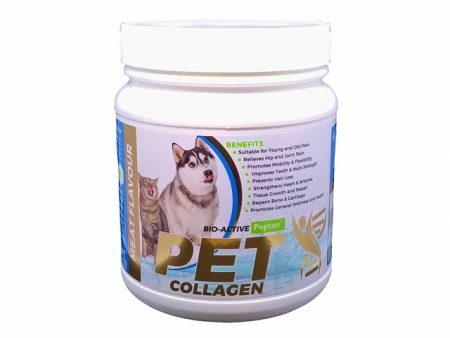 The Pet Collagen joint supplement does not only help your dog to regain his bone mobility, but also to build cartilage. It accelerates the bone reconstruction processes, after a fracture incident – as well as, it allows brittle nails & teeth strengthening to take place. Is it not frustrating to see your favourite life companion suffer from bone & muscle pains? Of course it is! This is why we poured in our unbelievably helpful joint supplement nature’s most elaborate ingredients. To provide your dog’s body the ability to become more active – to activate the bones & muscles into action – to give a hand helping your friend to rise from a motionless state! 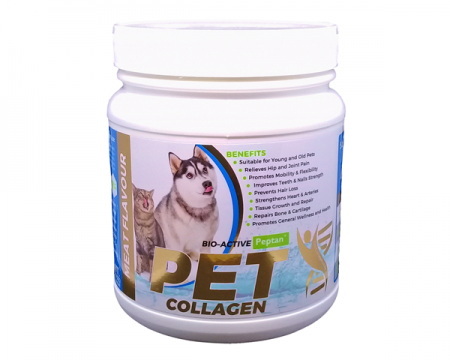 No dog or cat will be able to say no to Pet Collagen. It’s flavour makes it easy for the pet to get attracted to it, in order to eat. Persuading the pet to eat our Pet Supplement will be a piece of cake, unlike many other supplements. Just mix it with your pet’s food & let Mother Nature take care of the rest. Collagen is the most abundant protein in animals. Without it the body does not function optimally. The body produces its own Collagen until it reaches a certain age. At this point Collagen production decreases about 8-10% per year. This is what brings on the ageing process. 70% of protein in an animals body is made up out of Collagen. 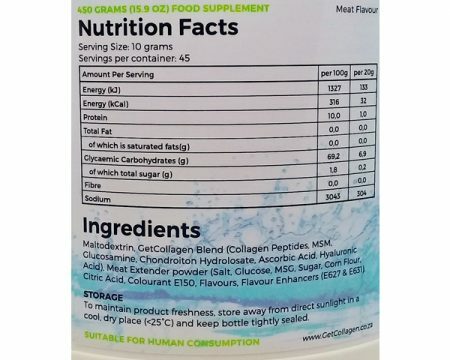 Collagen is not easily obtained in our daily diets and needs to be taken as an additional food supplement. 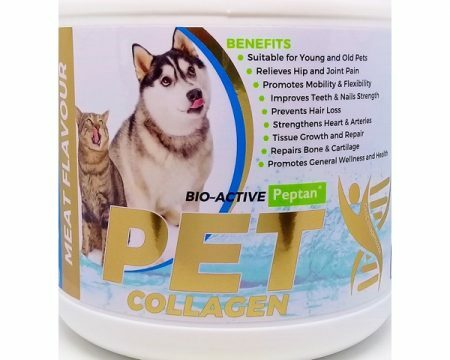 Pet Collagen is a dietary collagen supplement – containing a hydrolysed form of collagen fortified with amino acids, antioxidants, vitamins and minerals, scientifically bio-engineered to work on different metabolic levels to promote the synthesis of collagen proteins in your pet’s body. 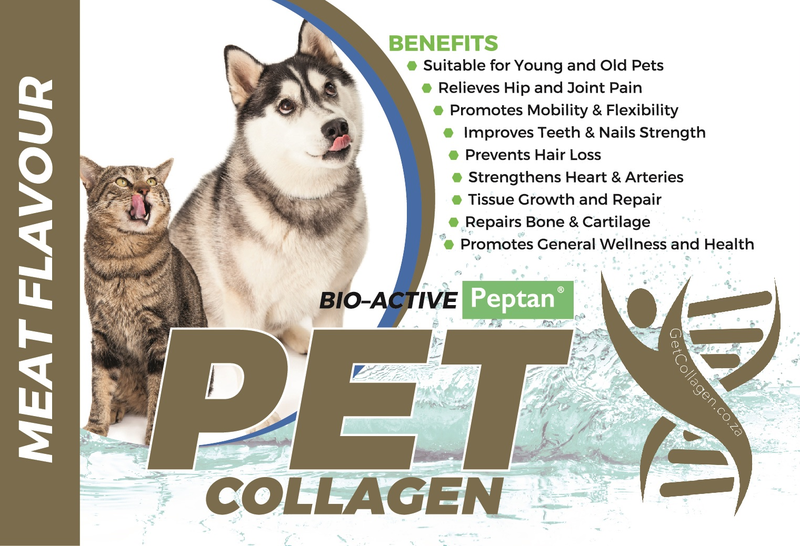 WHAT MAKES PET COLLAGEN DIFFERENT FROM OTHER PRODUCTS? Pet Collagen addresses all of the most important processes that contribute to the production, replacement, preservation and protection of newly formed collagen structures in the body. It is ideal for Dogs and Cats. Many dogs suffer from osteoarthritis, often in combination with hip dysplasia. It usually concerns older dogs, but there are also dogs which are already affected at a young age. In many cases painkillers are prescribed. Unfortunately these can be harmful to the dog’s health when used for longer periods of time. In addition, these painkillers only treat the symptoms of the disease and not the cause. Hyaluronic Acid (HA) is a key component of joint health and is found in the synovial fluids in high concentrations. Because of HA’s ability to bind with water molecules, it has a stiff viscous quality similar to “Jello”. 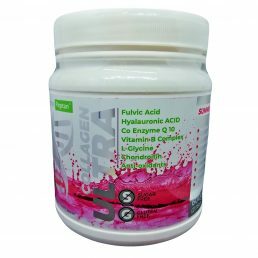 This allows it to naturally lubricate joints and aid in shock absorption. But as your dog/cat gets older, the HA in his joints may become damaged and production of new HA slows down. So supplementation is required to maintain optimum joint health. Hyaluronic acid (HA) has been shown to slow the progression of osteoarthritis and decrease inflammation within the joint. Specifically, it increases joint fluid viscosity, increases cartilage (GAG) formation, and decreases degrading enzymes and cytokines. Vitamin B-complex consists of a multitude of B vitamins. Vitamins B1, B2, B3, and biotin participate in different aspects of the production of energy in cells. Vitamin B6 is essential for the metabolism of amino acids. Vitamin B12 and folic acid ire involved in the division of cells. 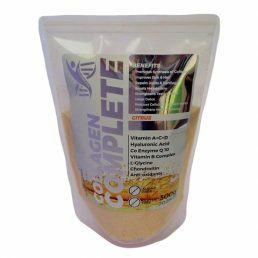 B vitamins are important in maintaining a suitable environment for neural regeneration and growth. Deficiency of B vitamins can result in a reduction of nerve reflexes and nervous control, retarded growth, a loss of appetite, loose stools, poor coat, abnormalities of the eyes, and potentially heart failure. 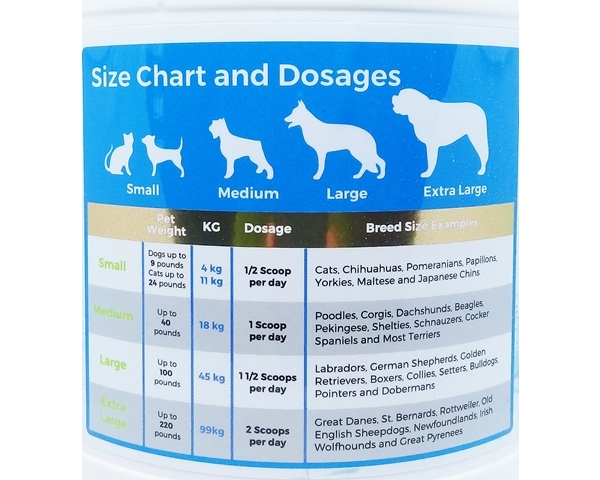 B-complex (in particular B2 and B6) is also essential for the prevention of bladder stone formation in dogs. Our favorite detox aspect of glycine is its ability to rid the body of heavy metals. The amino acid readily crosses the cell membranes and has a significant affinity for metals such as antimony, mercury, aluminum, nickel, and lead. Glycine facilitates the movement of metals from within the cells to the extra cellular space, where they can be filtered and excreted by the kidneys. Glycine also detoxifies the body from plastic residues, including BPA. With age, chondroitin levels in the body decline as joint tissues deteriorate. Loss of chondroitin can also occur due to an injury, trauma, or illness. Chondroitin supplements support cartilage health, helping to slow the deterioration of joint tissue and reducing the inflammation that occurs due to degenerative joint diseases like arthritis and hip dysplasia. 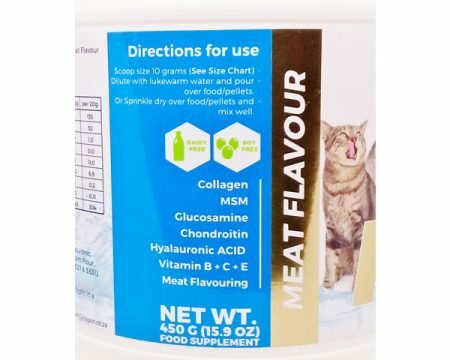 Therefore, many veterinarians recommend a chondroitin supplement to help ease the effects of these conditions, helping dogs stay mobile and improving quality of life in old age. Vitamin C is an antioxidant. It is best known for its role in the synthesis of collagen, a protein that is essential to the growth and development of skin, teeth, tendons, bones, cartilage and connective tissue. Vitamin C also is involved in drug, steroid and tyrosine metabolism and plays a role in the proper function of the immune system. Recent research suggests that vitamin C may reduce the risk of cancer of the stomach, mouth and lungs. It may also reduce the chance of tooth and gum disease and aid recovery from stress and exercise. 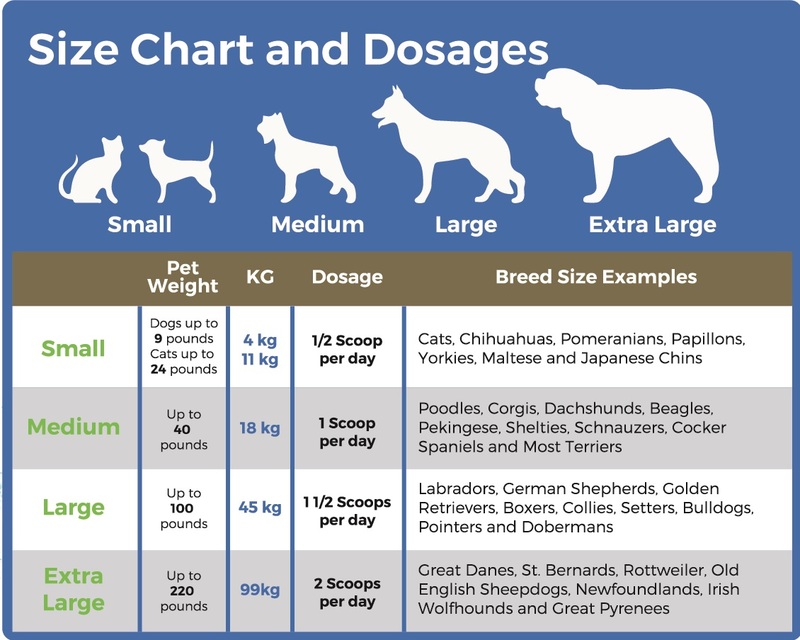 Yes, Vitamin E is beneficial for your pet. In fact, it’s essential! There is a link between deficiency of Vitamin E to cell damage in skeletal muscle, the heart, liver, and nerves. Dogs require essential vitamins and minerals just like humans do. … Also involved are three other minerals: sodium, potassium, and calcium, all dependent to some degree on the action of magnesium. These minerals are necessary for proper heart function, muscle movement and nervous system signaling. Magnesium has a number of important functions. It is necessary for the absorption and proper use of certain vitamins and minerals including Vitamin C, Vitamin E, calcium and phosphorus, sodium, and potassium. It is necessary for proper bone growth and is necessary for the functioning of many enzymes in the body, and production of protein. MSM is used to help treat literally dozens of illnesses, painful symptoms and diseases — and, yes, it’s been called a “miracle supplement” for all it does. MSM is a natural sulphur compound that’s derived from dimethyl sulfoxide. It is an anti-inflammatory supplement that also allows muscles to heal and decreases the pain that ailing dogs go through. MSM supplements are used to treat dogs suffering from digestive disorders, arthritis, allergies, eye problems and inflammation.